The release on Sunday is believed to be the first, large one of its kind since President Donald Trump signed an executive order Wednesday that preserved a “zero-tolerance” policy for entering the country illegally but ended the practice of separating immigrant parents and children. 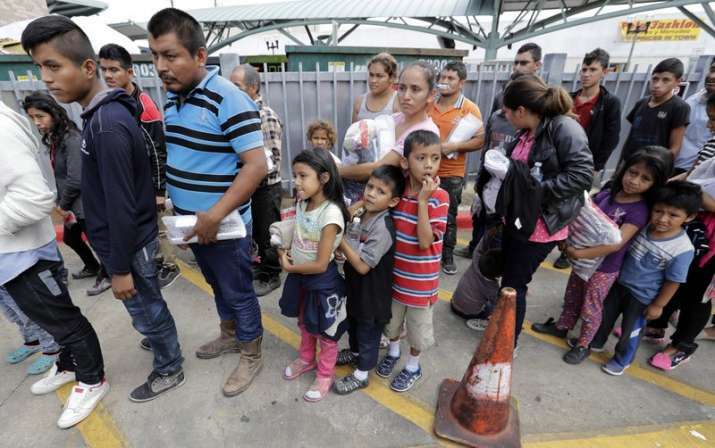 Immigrant families line up to enter the central bus station after they were processed and released by U.S. Customs and Border Protection, Sunday, June 24, 2018, in McAllen, Texas. A Texas charitable organization says 32 immigrant parents separated from their children after crossing the U.S.-Mexico border were freed into its care, but they don’t know where their kids are or when they might see them again despite government assurances that family reunification would be well organized. The release on Sunday is believed to be the first, large one of its kind since President Donald Trump signed an executive order Wednesday that preserved a “zero-tolerance” policy for entering the country illegally but ended the practice of separating immigrant parents and children. US Immigration and Customs Enforcement offered no immediate comment. Ruben Garcia, director of Annunciation House in El Paso, said the group of both mothers and fathers includes some from Mexico, Guatemala and Honduras who arrived to his group after federal authorities withdrew criminal charges for illegal entry. He didn’t release names or personal details to protect the parents’ privacy, and Homeland Security officials said they needed more specifics to check out their cases. It also said parents must request that their child be deported with them. In the past, the fact sheet says, many parents elected to be deported without their children. That may reflect violence or persecution they face in their home countries. How the government would reunite families has been unclear because they are first stopped by U.S. Customs and Border Patrol, with children taken into custody by the Department of Health and Human Services and adults detained through ICE, which is under the Department of Homeland Security. Children have been sent to far-flung shelters around the country, raising alarm that parents might never know where their children can be found.